Midwives have long been the guardians of normal physiologic birth, recognizing that labor often does not progress as efficiently and safely when interrupted by routine procedures or unnecessary interventions. Recent maternity care discussions within the professions and in the media have revolved around the benefits for mother and baby of allowing normal labor to progress on its own as safest and most conducive to satisfaction, bonding, breastfeeding and neurological development of the newborn. 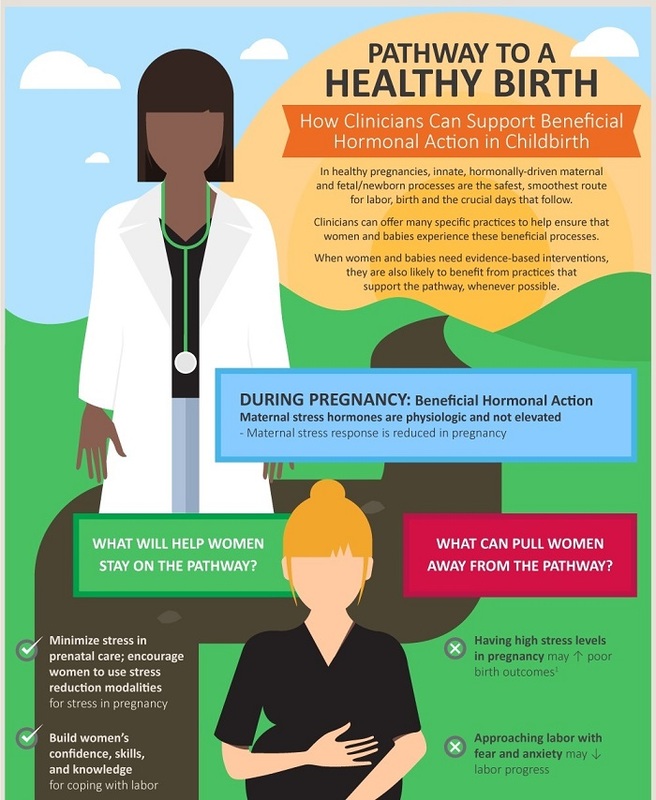 A new report from Childbirth Connections goes in depth to identify the hormonal processes that are critical not only to reproductive success but to long-term health of mother and baby. Hormonal Physiology of Childbearing: Evidence and Implications for Women, Babies, and Maternity Care provides compelling evidence that unnecessary medical interventions disturb these hormonal processes, reducing the benefits of physiologic pathways and creating new health challenges for mothers and newborns. Author Sarah Buckley describes the science of these innate hormonal systems that promote fetal readiness for birth, encourage safe and effective labor, reduce stress and pain, facilitate newborn and maternal transitions and adaptations, and optimize bonding and breastfeeding, among many effects. She discusses how routine procedures and medical interventions can interrupt and disrupt healthy labor and birth. 1. Provide education during pregnancy that builds women's confidence in their ability to labor and give birth without medical intervention that can pose additional risks. 3. Inform women about physiologic birth and involve them in their own care. 4. Limit routine practices and interventions to those that have proven benefits. 6. Foster privacy and reduce stress and anxiety during labor. 7. Employ non-pharmacological comfort measures for pain relief. 8. Provide continuous support during labor. 9. Facilitate spontaneous vaginal birth and immediate skin-to-skin contact between mother and newborn. Clearly, all of us can use the revelations in this report to better understand the impacts of our care and as midwives reassess our practices accordingly. Midwives have the knowledge, training and experience to support physiologic birth and have developed care models and practices around providing information, reducing stress, building confidence, allowing nature to take its time, and promoting healthy biologic processes and innate hormonal systems that this report shows are essential elements in the health and well-being of mothers and babies and families. What we now know from Unnatural Causes: "When the Bough Breaks" is that the stress hormones in pregnant women of color caused by the stress of daily engagements with racism may contribute to more complicated pregnancies and births, including prematurity and increased mortality and morbidity. The Buckley report's new information on the hormonal physiology of birth makes an even clearer case for the importance of access to culturally competent midwifery care for women of color as a way to address the disturbing and unacceptable disparity in outcomes for mothers and babies of color. Every woman deserves a midwife. Take a look at the MANA Homebirth Position Paper that outlines the values that guide the practice of homebirth midwifery.